On the basis of a broad range of valuation measures that are tightly (nearly 90%) correlated with actual subsequent S&P 500 total returns over the following decade, we estimate that stock prices are about double the level that would generate historically adequate long-term returns. The chart below presents estimated versus actual 10-year S&P 500 total returns using a variety of methods that I’ve detailed in prior weekly comments, and including a few additional ones for good measure. We presently estimate 10-year S&P 500 nominal total returns of only about 2.7% annually over the coming decade, with negative returns on all horizons shorter than about 7 years. These are, of course, the same methods that allowed us – in real time – to project negative 10-year total returns for the S&P 500 in 2000 even under optimistic assumptions, to identify severe overvaluation in 2007, and to quantify the shift to reasonable valuations in late-2008 and 2009 (our stress-testing response to the credit crisis was emphatically not based on valuation). Note also that valuations are not the sole driver of our investment stance, as should be clear from our shift to a favorable market outlook in early 2003, following the 50% market plunge in 2000-2002. Fortunately, the prospect of awful market returns and steep downside risk from present market levels certainly does not imply a lack of opportunities over time. Valuations adjust, and market conditions change. I fully expect to observe outstanding investment opportunities over the completion of the present market cycle and the next, even if a moderate retreat in valuations leaves them well above historical norms (as we saw in 2003). Now is not the moment to feel rushed to commit capital to a Fed-induced speculative carnival. Needless to say, Wall Street wishes investors to believe that valuations are just fine, and one can hardly watch CNBC for 10 minutes without some reference to stocks being “cheap on forward earnings.” There are clearly useful ways to use forward operating earnings to obtain useful estimates of prospective equity returns (as shown above). But investors should be aware of the profound inaccuracy of valuation estimates based on unadjusted price/forward operating earnings and the “Fed Model” (which largely underlie the “equity risk premium” claims of Greenspan, Bernanke, and Yellen). The fact is that the errors of those models can be predicted in advance from the level of profit margins at the time of the forecast. 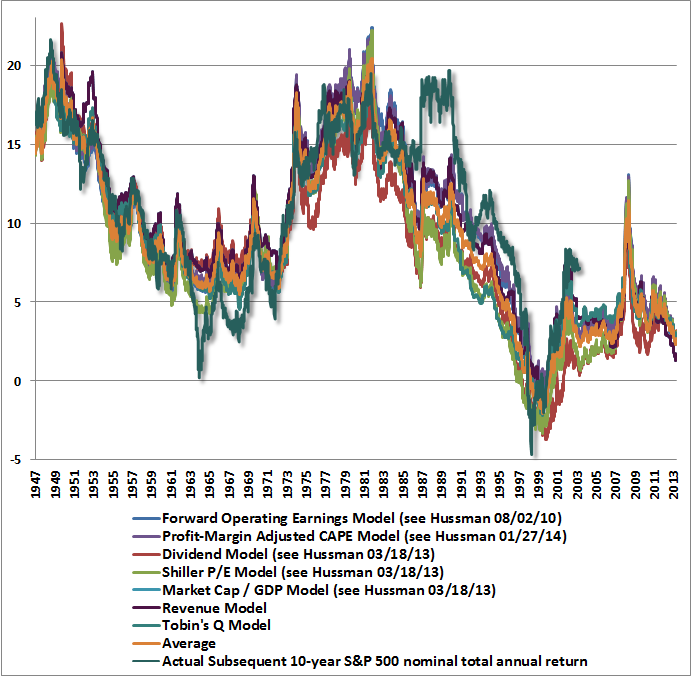 The higher the level of profit margins, the more these models tend to overestimate future returns, compared with how stocks actually perform in the following years. The glib confidence placed in these models in 2000 and 2007 is enjoying a full – and likely tragic – revival at present. While the 10-year Treasury yield is just 2.7%, that level is “low” primarily relative to the inflation-disinflation cycle from 1970 to 2000. A 2.7% yield is really not much different from the level that Treasury bonds provided throughout history prior to about 1970. More important to recognize is how weakly the 10-year Treasury yield is related to stock market returns. The correlation between the 10-year Treasury yield and reliable estimates of 10-year S&P 500 total returns (like those shown in the chart above) is only about 0.13. The correlation between the 10-year Treasury yield and actual subsequent 10-year total returns for the S&P 500 is also only about 0.13 (for geeks, that’s an R-squared of less than 0.02). There’s no question that sustained trends in interest rates can significantly impact stock prices, particularly when they are driven by unexpected inflation or deflation. But the initial level of 10-year Treasury yields explains virtually none of the variation in S&P 500 total returns in data since 1940. Examine the data and prove this to yourself before taking Wall Street’s bait. The Hussman Funds continue to be strongly defensive toward equities. Strategic Growth continues to carry a “staggered strike” hedge that raises the strike prices of its index put options closer to market levels. As I’ve noted in recent weeks, depending on the frequency of opportunities to shift strike prices and expirations, we can expect some “give and take” from those index put options on a day-to-day basis as the indices fluctuate. Strategic Dividend Value Fund continues to hedge about 50% of its equity exposure. Strategic International remains fully hedged. Strategic Total Return Fund remains modestly constructive toward bonds and precious metals shares. Overall, we remain defensive here, and our investment stance will change in response to shifts in the return/risk profile we estimate.